These are players who know the rules and are consistent with their ground strokes or those who have good technical ability and are regularly playing tournaments. These are players new to tennis / have only played a few times before or an improver who is improving technical and coordination skills, whilst getting to know the rules. A shorter racket of 43cm – 58 cm (17″ – 23″) is recommended depending on the size and strength of the player. 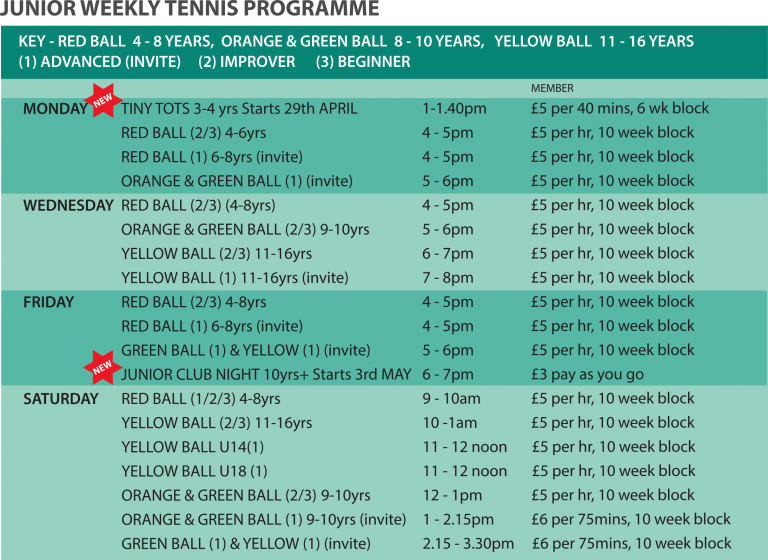 Mini Tennis Orange is a great way for players to continue their progress from Mini Tennis Red and is for players aged 8 and 9. It is played with shorter rackets, softer balls and courts are bigger and wider than the red stage, but still smaller than full-size tennis courts, allowing players to develop a rounded game whilst learning a range of techniques and tactics. A racket of 58cm – 63 cm (23″ – 25″) should be used depending on the size and strength of the player. It’s the next stage before moving on to full compression yellow balls on a full sized court and helps players develop and improve all aspects of their game. A bigger racket of 63cm – 66cm (25″ – 26″) should be used but not compulsory. Improving to a level where they feel comfortable joining in with adults or to get their senior privileges.